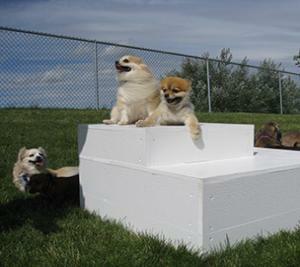 The Pacific Steel & Recycling Trailside Dog Park is located at 800 River Drive North adjacent to River’s Edge Trail. It is part of the City of Great Falls public park system, and hours of operation are the same as other public parks – dawn to dusk. An attractively fenced and landscaped area where dogs can run and play “off leash” with their canine and human friends, it is a great place for dogs to exercise and socialize with other dogs. And, yes, the people enjoy the same amusements! The park features separate fenced areas for big dogs and small dogs. These off leash areas are divided by a plaza with benches and a pavilion – an excellent viewing area for people who may not have a dog but would like to watch dogs romp, run and retrieve. Disposal bags and garbage cans are readily available, of course. A drinking fountain for both dogs and humans is also in place at the dog park, but this feature is winterized during the cold months, so please be prepared by bringing water for your dogs. We ask that you use proper pet-etiquette, and obey the rules of the park. 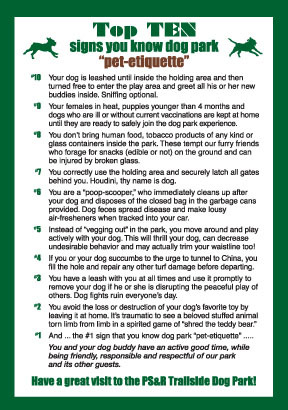 Download the Pet Etiquette PDF. 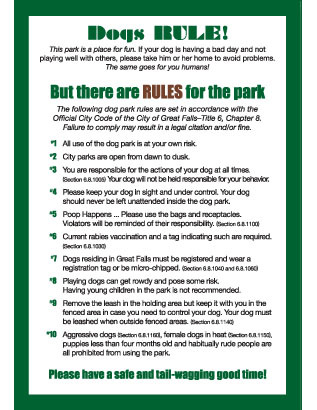 Download the Dog Park Rules PDF. 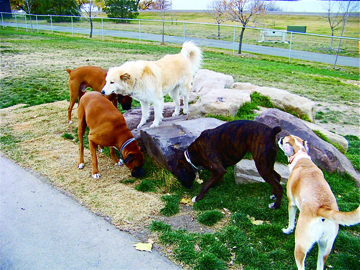 HISTORY: The City Commission approved the dog park on December 4, 2007, and the Animal Foundation’s volunteer dog park committee worked diligently to develop this wonderful amenity to our community. The gates were opened on July 15th, 2009. We continue to work with the City to maintain the park, and recently installed the paved path in the large dog park to protect the turf and more agility equipment in the small dog side to allow for better exercise. The paved parking lot between 6th and 9th Street North serves as the parking lot for the dog park and is now officially known as the Dog Park Trailhead. 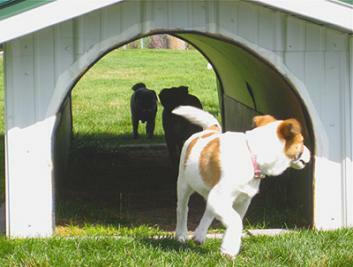 A vault toilet was purchased as a partnership between the Animal Foundation and Recreational Trails, Inc., and has been installed near the entrance to the dog park. 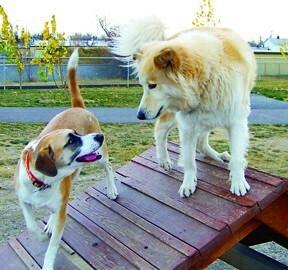 The dog park may be temporarily closed on occasion for maintenance or improvement projects. Please watch the Great Falls Tribune for announcements or call the Park & Recreation Department at 406-771-1265.